Size of Male: 60-75 lbs., 22-26 in. A long list of positive attributes is heaped on the Collie, but if you’re a movie goer, the one thing that will remind you most of the breed is the film “Lassie.” Deemed one of the most elegant and handsome dog breeds, Collies have so much love and affection to give. In return, they require a calm, stress-free and caring atmosphere. There are speculations that the term “collie” means “useful” in Gaelic language. When you think about it, it’s not surprising. The breed is actually several hundred years old, then serving as Scotland’s utility dogs herding cows and sheep. The “big break” and rise to fame for this dog breed occurred in the late 19th century when Queen Victoria felt taken by the dog’s elegant beauty. The queen later presented this breed in a dog show, and the elite community was quick to follow suit. The breed became known not only as a useful canine but also as a status symbol. These beautiful dogs are extremely friendly, sensitive and sociable. They are not aggressive, but they make effective watch dogs because they are prompt to bark warnings. If you desire a home companion that’s intelligent, sweet and highly affectionate, then you can’t go wrong with this breed. Their playful nature can sometimes lead them to nip at your heels, as if to “herd” you and the children. Living Environment – Either apartment living or suburban dwelling is fine for these dogs. Generally, they prefer to stay with their owners indoors rather than linger in the outdoors alone. Of central importance in this breed’s living environment are the following: a cool temperature, a calm atmosphere, positive human interaction, and plenty of mental and physical challenges. You may want to keep your yard fenced, too. Due to their herding background, they are attracted to moving objects and will most likely chase after them. Grooming – Grooming requirements vary according to their type of hair. The rough-coated variety is low-maintenance and may only require weekly brushing. If your dog has a smooth coat, you may need to comb your pet everyday. Expect the breed to shed heavily at least two seasons a year. Diet & Exercise – For their size, these dogs are ironically slow, graceful eaters. They are prone to weight gain which is why a feeding schedule is recommended and meals are limited to two in a day. 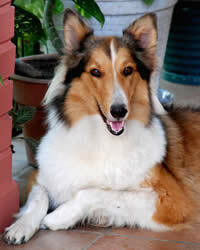 It would be wise though to avoid giving your collie seasoning-laden meals for health reasons. Daily exercise is a must for this breed. Don’t worry though; you’re not required to engage your pet in exceedingly physical activities. A quick game or a long stroll in the park will do. If you were to ask the dog though, chances are your pet will prefer herding exercises. Health – In general, this is a hearty dog breed. Still, do not let them skip their regular vet visits and checkups. Eye defects that can lead to blindness, as well as tumor growths and skin allergies have been documented in some of these dogs. In addition, veterinarians warn that it’s not advisable to interbreed two of these dogs with merle coloration. Apparently, the union will be a genetic disaster. Overall, you shouldn’t have a hard time training the Collie. The breed is highly intelligent, loves mental challenges and seeks to please its teacher. They are quick to take initiative in herding techniques. For other forms of exercises and tricks, you need only to be gentle with the dog. Positive dog training techniques work best (praise and rewards). Harsh commands can easily break their spirit and may also strengthen the dog’s resolve to be stubborn at times.